"Messages are not syncing between my iMac and iPhone X running iOS 12. Also when I try to create a new message on my Mac and type in TO: there is no longer any auto suggestion from my contacts on the Mac." Mac and iPhone users can use iMessages to send and receive messages between all iOS ( iOS 12 included) and Mac devices over a cellular or Wi-Fi network. By logging into multiple devices using the same Apple ID, iMessages can be synced across all these devices, making them available on the Mac, iPhone, iPad or iPod. But the process is not without its issues. Like the problem mentioned above, sometimes for a number of reasons including iOS 12 update, iMessages can fail to sync between Mac and iPhone. In this article, we take a look at some of the solutions to overcome this problem. The first thing you should do when faced with this problem is trying to turn off iMessages on both the Mac and the iPhone and then turn it back on. 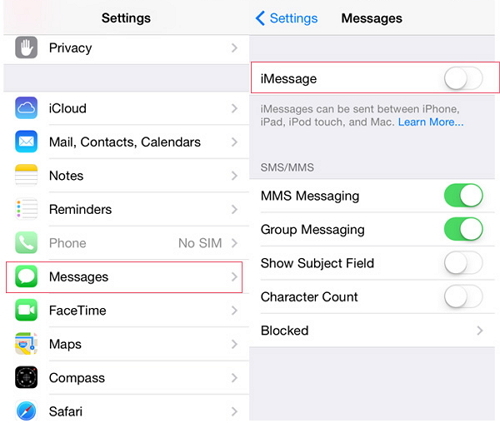 On your iPhone, go to Settings > Messages and toggle iMessage off. On your Mac, open the iMessages app and then click on Messages on the top-menu. Click Preferences and then choose Accounts. Uncheck "Enable this Account" under your Apple ID. Wait a few minutes and then enable iMessages on both device and then check if the messages sync properly. You also need to check your settings to ensure that you are signed in to both devices using the same Apple ID. Apple just released iOS 12, some people find their iMessage settings have been changed after iOS update. To do that on your iPhone go to Settings > Messages > send & Receive. Under the "You can be reached by iMessage at" section, make sure that your phone number and Apple ID are listed with a checkmark. On your Mac, open the Messages app, click "Messages" in the top menu and click "preferences." 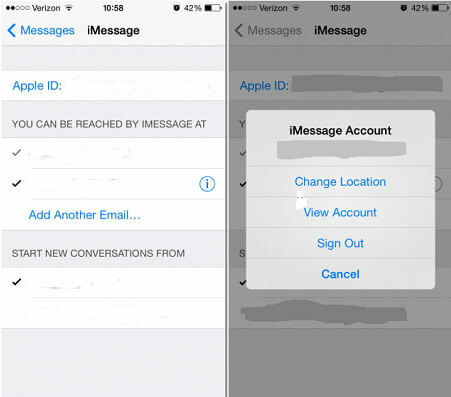 Choose "Accounts" and under the "You can be reached for messages at" section, make sure the phone number and Apple ID match the settings on your iPhone. Sometimes just one of the devices can be failing to receive the messages on time. To fix this, you can simply send a message from the device that is lagging behind. Doing this will almost always trigger all the other messages that hadn't synced with that device to begin flowing in. It may seem like an unorthodox thing to do but it works. For example, if the iPhone is receiving the messages just fine and the Mac isn't, try sending a message from the Mac. We've done this and seen the Mac begin to receive all the other messages that had failed to sync before. Usually the solutions above should work very well to get your devices syncing correctly. But on rare occasions when everything you do doesn't work and you still need to sync your iMessages, you may want to try an alternative way to sync messages between the iPhone and the Mac. 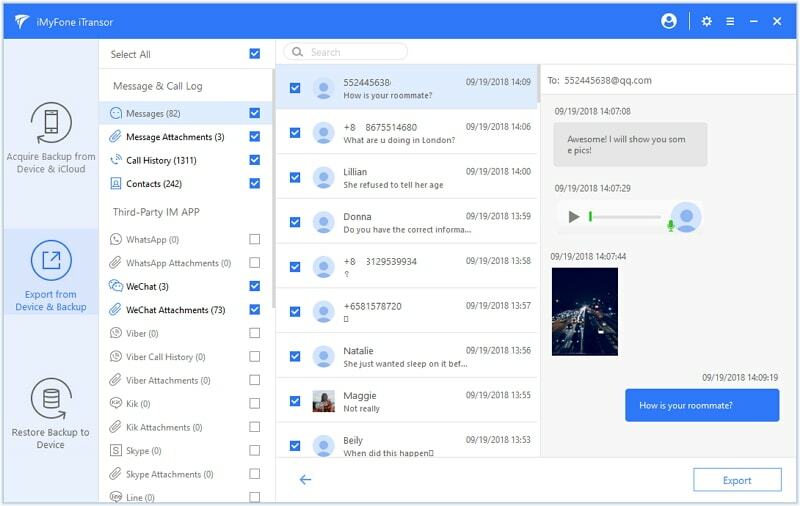 This backup and restore tool known as iMyFone iTransor (iOS 12 supported) will allow you to export all the un-synced messages and iMessages from your iPhone to the Mac. 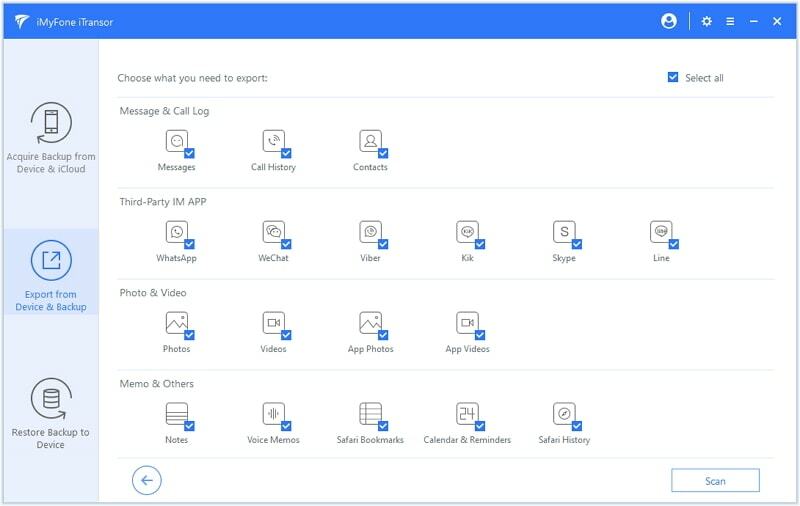 It can be used to export up to 20 different types of data from an iOS device, an iTunes or iCloud Backup to computer, such as messages, contacts, photos, videos, WhatsApp data, WeChat data, etc. It enables you to back up the whole data of your iPhone, or back up only the selected data. A good choice to save your precious time. It allows to restore a partial backup without overwriting the other data on their devices. It wil merge the data on your device and in the backup files, so you have both new data and old data on your device. To use iTransor to transfer iMessages to your Mac, download and install the program to the computer and then follow these simple steps. Step 1: Launch iTransor on your Mac and from the main window and connect your device with the computer. 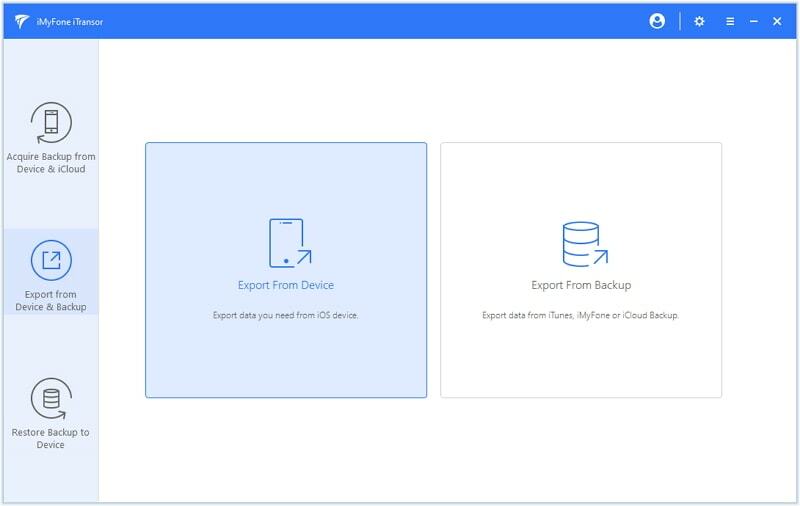 Choose Export Data from Device & Backup. Select Export from Device. 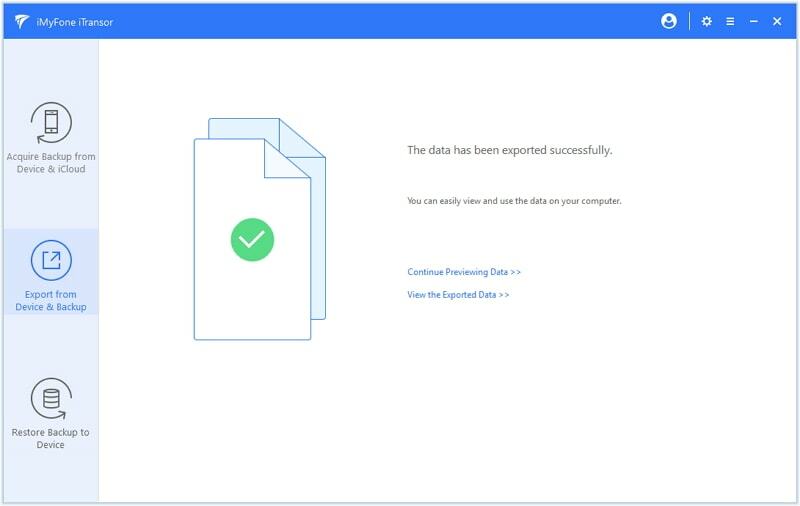 Step 2: On the next window, choose the type of data you'd like to export. In this case we choose Message. Click Scan to allow the program to scan the device for the available messages. Step 3: Once the scan is complete, you should see a list of all the messages and iMessages on that device in the next window. Select the ones you'd like to export to the Mac and click Export. Then you can select the format of the exported files and location to store the files. After a short while, your iMessages will be synced to your Mac. The messages will now be available on your Mac as well as on your iPhone. The failure of iMessages to sync across devices is a common problem that we've seen occur more than once even in iOS 12. The above solutions almost always work to fix this minor yet frustrating problem. Share your thoughts with us in the comments section below. We'd love to know which solutions worked best for you or what you did differently if any.